Celebrating the life of Sherilyn Joyce Scott "Bootsie"
Be the first to share your favorite memory, photo or story of Sherilyn. This memorial page is dedicated for family, friends and future generations to celebrate the life of their loved one. Obituary for Sherilyn Joyce Scott "Bootsie"
Sherilyn Scott, 65, died February 11, 2019. On April 24, 1953, Sherilyn Joyce Scott was born to Delois Faye Smith in Memphis, Tennessee. “Bootsie," as she was known to many, was a generous, free-spirited, feisty and creative soul. A majorette & graduate of Manassas High School in 1971, she was smart, fun, and persistent, she was known in North Memphis for being a bold beauty with gorgeous skin, fire-engine red-blond hair & killer legs with a keen eye and penchant for the latest fashions. Sherilyn had particular talents for cosmetology, illustration and a passion for reading fiction novels and Jet & People magazines, and staying current on world news and current events. In her young life, she proved deliberate and a force with which to be reckoned. At age 10, Sherilyn asked her mother's husband, John Oliver Scott, “can I call you my daddy." Upon his confirmation, he lovingly adopted Sherilyn, and she had her a daddy — for life! She appeared on his show, The Johnny Scott TV Show and worked alongside him at Fuller Golf Course. Baptized at Hill Chapel M.B. Church by Rev. E.L. Slay at age 11, she was active in church activities including the Sunshine Band, Vacation Bible Study. 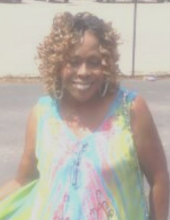 She was a also Candy Striper at John Gaston Hospital, and attended Tennessee State University and Memphis State University., she enjoyed being the only child for 10 years until the arrival of Olivia Faye in 1973, who became her tagalong kid and involuntary hair & nail practice model while Bootsie attended Jet Beauty College. Although a part of a loving, respectable family, Sherilyn succumbed to the crack crisis in the late 80s after her son’s birth in 1984 — in part due to post-partum depression. She battled with drug and alcohol addiction for 31 years. She was a loving mother to her son Justin until the grip of the disease won. Her spirit and will were strong, but as many battling this epidemic, the disease was stronger. Through it all, Bootsie had finesse, maintained standards and never lost her love of family and zest for life. She strived to respect her family’s repute and made efforts to keep her lifestyle distant from theirs. As a mother to Justin and Jasmine, now 34 and 28 respectively, she made difficult decisions to protect her children from her personal life struggles so they could be raised in better environments than she was able to provide at that time. After recently attending her daughter’s college graduation, she expressed how grateful she was for her daughter’s life. Sherilyn was also in regular communication with her son Justin, and with her grandchildren as well. Sherilyn was particularly protective of her mother, who was her fiercest protector. And she deeply loved her daddy, whom she called daily, encouraging him recently to enjoy more fried foods (like her) rather than his healthy diet of “salads.” She honored her parents with a grand surprise 25th wedding anniversary party that was a night to remember for all. She was both a giver and a fighter. The Bootsie we all knew and loved strived to live and fight through life’s toughest times. She made it her business to tell young girls to follow a different path than her own even to go as far to say "let my life be an example of what not to do” (particularly to her goddaughter and younger sister). Her sincerity and awareness of her struggles will hopefully serve a higher purpose in the lives she touched. Her fun nature and generous spirit will remain with her family forever and through her survivors. Surviving her passing are her father, John Oliver Scott (Memphis); son, Justin Oliver Scott (Memphis) and daughter, Jasmine Asherai Smith (Dallas); sisters Jeanna Brandon (Beryl) (Memphis), Olivia Scott (New York City), and brother Vincent Carr (New Jersey), four aunts, Harriet Ijames, Lelia Smith, Louise Smith and Patricia Smith (Memphis); three grandchildren, Precious Scott, Cyncere Mable Scott and Justin Scott, Jr. (Tennessee); one goddaughter Vontnya “Bonnie” Burke (Memphis), and childhood friend Susan Brown (Memphis). She also leaves her son’s father & friend, Andre Davis (Chicago), two nieces, Erika Banks and Alana Green (Memphis), and a legion of cousins and friends. Preceding her in death, are her beloved mother, Delois Faye Smith Scott, and three dear cousins, Phillip Jones, Sr., Dana Woodson and Lloyd Gregory “Butch” Smith. May she rest in peace and forever bloom in her next life. Any love offerings will be given to her children Justin & Jasmine and offered as a donation to the Grace House of Memphis (http://gracehouseofmemphis.org/), where Sherilyn was a resident in the late 80s, to support other women on similar life journeys. To plant a tree in memory of Sherilyn Joyce Scott "Bootsie", please visit our Tribute Store. "Email Address" would like to share the life celebration of Sherilyn Joyce Scott "Bootsie". Click on the "link" to go to share a favorite memory or leave a condolence message for the family.